It is October in Valle Crucis. I ventured downtown to take a couple of shots and to pick up my mail. In the process I met two new friends. First, I had the pleasure of meeting and conversing with Maria over at the Alta Vista Gallery and B&B. I lingered in the historic Farthing home which is covered in outstanding works by the likes of local artists B. Jean Baird and J. Sporn. I'm nosey so I slipped around to the side of the house and saw this little guy wearing his fall colors. Maria told me that he is one of the most photographed item by visitors. 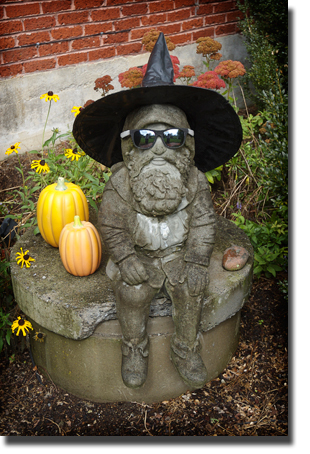 Naturally, I did the obvious and snapped a photo of the Valle Crucis Nameless Gnome. Afterwards, I slipped by the Mast Store where I was introduced to Stewart Little (Hush. I'm sure he's never heard any of the jokes you're thinking right now.) Come to find out, Little is a photographer and has a Flickr site with some great photos of the area posted. This is one of my favorites. Tags: Gnomes, Valle Crucis N.C.